Living in a multicultural area isn't all up-side. The lack of Tesco Metros and other mini western supermarkets mean that sometimes mundane things that a middle-class white guy takes for granted are harder to find. Take pro-biotic drinks for example. While I'm pretty sure these started off in Japan, the need for things that seem to be healthy but backed by a little science here is immense. You only have to look at all the fake science on shampoo adverts to understand what I mean. The adverts and packaging for pro-biotic drinks and supplements have undergone a change in the past 12 months as to advertise using these in the UK the manufacturers had to scientifically prove and publish their proof for the health claims. They could not. The two big players (Yakult & Actimel) did get an extension for further trials but for everyday healthy people taking these drinks is no more beneficial than not doing so. There is however evidence to suggest that if your 'gut flora' has been disrupted by something such as food poisoning or antibiotics that these little boosts do help you return to your previous health quicker. So, as I'd been ill recently I took this as a perfect opportunity to try these out. While I couldn't find the big brands with their specific patented subspecies of 'friendly bacteria' this Lidl variant has L. Casei in it (but doesn't state the bacterial load on the bottles) and will suffice. The packaging recommended that one a day could be beneficial, so throughout the day I drank a total of three. In the interests of scientific full disclosure I also went for a curry that evening. The flavour was as usual somewhere between strawberry milkshake and yoghurt. Not at all unpleasant but lacking that signature Yakult taste (which I quite like). Effects wise there was nothing particularly bad or good. I do feel less nauseous today than I have on previous days but that could just be the gradual process of getting better. At 89p for four little bottles I don't think it's going to hurt to give something like this a try after a stomach related illness, but I don't think that it's anything more than a helping hand (and a nice little shot of strawberry milkshake)! 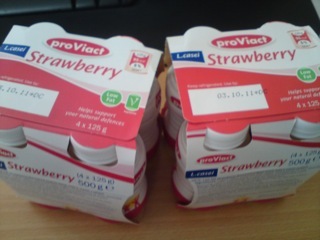 I have been told by my chemotherapy nurse that these probiotic yogurts are good to replace the bacterial flora killed by the Chemo drugs. So although there may not be firm evidence to back up the claims it appears that at least anecdotally there is some good to them. She also said brand made no difference so Lidl or Aldi own brands work just as well.